Posted in Chicken, Soups, on August 3rd, 2012. 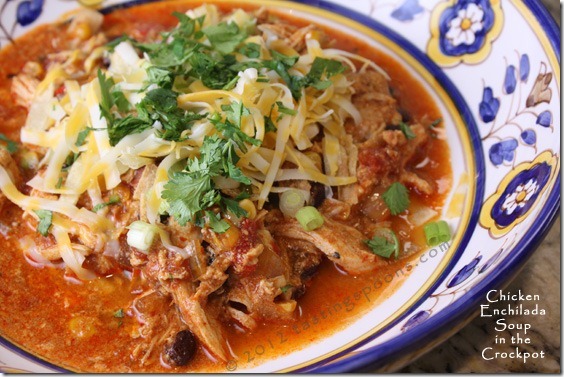 You’ll find very few crockpot recipes here on my blog. Not because I don’t like them – but just because I’m home all the time and usually prefer to make soups on the cooktop. I suppose this one wouldn’t have to be made in a crockpot – but gosh, it’s SO easy this way! If you’re employed full time or have a really busy schedule, this soup/stew will rock your world not only with ease but with flavor! If you love Mexican food, well, this is a shoe-in, then. As I was cropping and adding text to my photos for this blog post, my fingers were almost itchy to get to writing about it because this soup is so fantastic! Oh my yes. Before I start writing I always work with the photos first, then I prepare the MasterCook recipe that gets exported to a pdf and as a text file (that goes into the box below). Once that’s all done (usually takes me 10-15 minutes or less) then I start writing. My mouth is watering looking at the photo above. Back when crockpots first came out (wow, that was 1971), the recipes generally under-whelmed me. They lacked sufficient layers of flavor, I suppose. Yes they were easy. Yes, they helped with meal-making when I was a full-time working mom, and yes, the cleanup was easy too. But my first crockpot was ceramic, and back then you either had to brown meat in another pan (taking more time, and giving you another dirty pot) or you had to use raw meat, which is generally what I did. Now I know better – so much of the flavor in meat comes from that caramelization when it’s browned in a pan. So when I bought the Cuisinart Multi-Cooker, 7-Quart , all that changed because it has a heavy insert (coated in a nonstick surface) that can go right on the stove (to brown the meat first) and then you lift up the whole thing and put it into the crockpot. I don’t use it all that often, but I love it when I do. And I now have several crockpot cookbooks that are truly new-age – at least current age, with more steps to preparing it, but things come out tasting a whole lot better. So back to this recipe. My friend Linda T was telling me about a crockpot enchilada soup she makes, that she got from her daughter Kristin. On the printed page Linda mailed me it said the recipe came Krissy, over at Dainty Chef, a blog. I followed Dainty Chef’s recipe nearly all the way through, only veering off with my combo of garnishes (I love cilantro). It’s one heck of a great recipe. In a nutshell, you first make a thin milk sauce mixture (I used 2%) that gets mixed with some canned enchilada sauce. Now, I have to tell you, here’s where I veered off – it just happens that when we had family visiting recently, they went to one of their old family favorite restaurants, called Los Jarritos (on N. Garey in Pomona, no website, but you can read about it on Yelp). Our son-in-law, Todd, just loves this place too. This particular trip he had his mother Ann in tow (who just happens to be a great Mexican cook) and she usually buys a quart of their enchilada sauce whenever she’s there and takes it home. She did buy it and came to stay with us her last night, and put it in my freezer. You can guess what happened? She forgot it. So, my plan was to leave it there and the next time one of the family visits they could take it home (500 miles away). But then I got to this recipe . . . and I don’t have any canned enchilada sauce . . . and the lightbulb went off in my head . . . oh, I can use Los Jarritos’ sauce that’s in the freezer! So there’s this saucy stuff (the thin milky sauce mixed with the enchilada sauce). First, though, you put into the crockpot a can of drained and rinsed black beans, some corn, Rotel tomatoes, some onion and bell pepper. Here I need to tell you something else – Rotel tomatoes are spicy hot. If you find them too hot, I’d suggest you use regular canned (diced) tomatoes and the juice, and add in canned green chiles and a bit of jalapeno for heat. For most adult tastes I think one can of Rotel would be fine. The restaurant enchilada sauce I used happened to have a lot of heat in it, so we had some really smokin’ hot soup. Then you put the raw chicken breasts on top, cover with the enchilada sauce mixture and crockpot it on low for 6-8 hours (or on high for 3-4). About half an hour before it’s done, remove the chicken breasts and let them cool just a bit so you can handle it. Then shred it up into small bite-sized pieces and put it back into the crockpot and stir it all up to allow the chicken to re-heat. Meanwhile, prepare the garnishes. Scoop a heaping cup (or 2 for hearty eaters) of the soup mixture into a bowl and top with the garnishes of your choice. What I liked: well, the flavor is paramount. It was fantastic. I loved all the layers of flavors – from the complex enchilada sauce to the textures in the beans, corn, tortilla chips and then the cool, refreshing cilantro and green onions. Altogether fantastic. It was easy enough – you do have to make the sauce, which does take 10 minutes or so. Open a few cans, but really that’s it until you’re ready to serve and need to fix the garnishes. Overall, very easy. I’ll make this for a big family dinner for sure. Maybe soon. A green salad on the side would be all that’s needed. What I didn’t like: absolutely nothing at all! Will make this again. And again. It’s probably going onto my Carolyn’s Favs list. NOTES: Rotel tomatoes are very hot – if you want to tone it down, used canned tomatoes and add canned green chiles or jalapeno peppers to suit your heat tolerance. If you have a source (a Mexican restaurant) that makes their own enchilada sauce, it might be worth finding it. A good, thick sauce makes a big difference. 1. Melt butter in a saucepan over medium-low heat. Stir in flour; keep stirring until smooth and bubbly. Remove from heat and add the chicken broth and ½ cup milk, a little at a time, stirring to keep smooth. Return to heat. Bring sauce to a gentle boil; cook, stirring constantly, until it thickens. 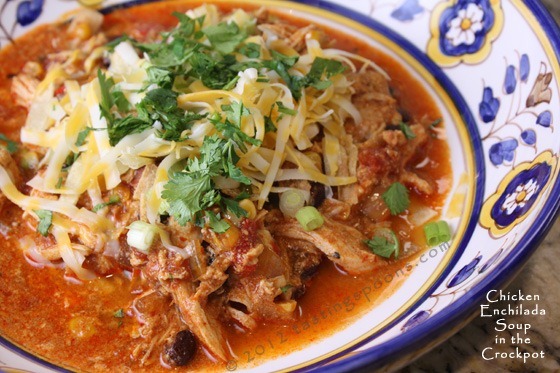 In a large bowl, whisk together the enchilada sauce and chicken broth mixture . Gradually whisk in remaining milk until smooth. Set aside. 2. In a crockpot, combine drained beans, tomatoes, corn, onion, and bell pepper. Place the chicken breasts on top of the mixture. Pour sauce mixture over ingredients in cooker. Cover; cook on low heat for 6-8 hours or on high for 3 to 4 hours. 3. When you are ready to serve, remove chicken and cut or shred into bite-sized pieces. Add chicken back into the soup, mix together. Top with cheese and serve. Use your choice of toppings: avocado, chopped green onions, sour cream, cilantro and crushed tortilla chips. Per Serving: 524 Calories; 19g Fat (32.0% calories from fat); 31g Protein; 61g Carbohydrate; 12g Dietary Fiber; 66mg Cholesterol; 541mg Sodium. Hi, Carolyn! You came to the rescue again! I’m going to be gone for a few days and then come home with a house guest in tow. We’ll arrive home about noon on a Sunday, and we’re going to a concert that night. I was trying to think of a quick and easy supper, and this is it! We’re having your grilled pound cake with balsamic peaches while she’s here, too. (And by the way, your corn salad was a big hit at a family get-together last month.) Your recipes have a great track record with me. Thanks much! Oh, we had the pound cake with balsamic peaches when you first posted it, and many times since. That may be my all-time favorite of your recipes. Haven’t done the soup yet, the company is coming the weekend after next, but it sounds perfect for the occasion. It’s hard to find enchilada sauce in my supermarket. They had one brand–Hatch–and no mild except in green. I’ll use regular tomatoes and hope it’s not too spicy for my husband, who is very sensitive to that sort of thing. For that reason, I make things mild and offer something to spice it up for those who prefer it hotter. I’m thinking the milk sauce should help to tone it down, too. Bookmarked; this sounds so good! Thanks for the tip. I’ll try it next time I get to TJ’s. I finally got the soup made, and it was a big hit with my husband and the friend we had to lunch yesterday. I substituted regular tomatoes for the Ro-Tel and added a can of green chiles. I used the Hatch medium enchilada sauce, and since the can was 15 ounces, I just used half so I could freeze the rest for another batch. It turned out perfect for our tastes. I loved that it was so quick to put together. We’ll be having this again! This looks great, my only concern before making this how did the milk not curdle after so long at high heat? Thanks! Just thought I would comment that we LOVE this recipe. It has become a staple in our house. I have yet to find one that tops it. So THANK YOU!